Destined for a classified position somewhere in orbit 22,300 miles above the planet, the Air Force's second Space Based Infrared System Geosynchronous satellite, known as SBIRS GEO 2 for short, will further upgrade the nation's surveillance network to detect and track missile launches around the globe. "Our ability to provide strategic missile warning is critical to the nation's survival," says Gen. William Shelton, leader of Air Force Space Command. Devised in the Cold War to provide warning of intercontinental ballistic missiles launched at the U.S., this national security space project has broadened to cover short-range missiles and threats facing troops on the modern day battlefield. "I would argue that the nation's missile warning system is critical now, or perhaps even more so, than it was even during Cold War," said Col. Jim Planeaux, director of the Infrared Space Systems Directorate at the Air Force's Space and Missile Systems Center. "Certainly strategic and tactical missile threats have proliferated in both number and type, (and) the number of countries that own these systems has increased. So with SBIRS our core mission continues to be that missile warning, and we're modernizing the nation's systems so that we remain highly capable against today's threats, just as we have through the 40 years of DSP legacy, and we'll continue to meet the needs of our national leadership, decision makers, our warfighters and our allies." Once the system detects a target, it determines the flight trajectory and where a hostile missile will hit, giving warfighters the necessary alert to intercept the weapon as part of the OODA loop (Observe, Orient, Decide and Act). The satellite launching Tuesday will work to expedite that time-critical sequence by identifying faint missiles faster and allowing forces to engage sooner. In 2011, early-warning surveillance was used "to alert our forces and those of our global partners to nearly 200 missile launches and to report an additional 7,100 special infrared events. And I believe with some of the activity we're seeing around the world even this year, we're seeing an increase in the number of global missile launches," Planeaux said. On Friday, Defense Secretary Chuck Hagel announced deployment of additional missile interceptors in Alaska to guard against increased threats from North Korea and Iran. "The United States has missile defense systems in place to protect us from limited ICBM attacks, but North Korea in particular has recently made advances in its capabilities and has engaged in a series of irresponsible and reckless provocations," Hagel said. 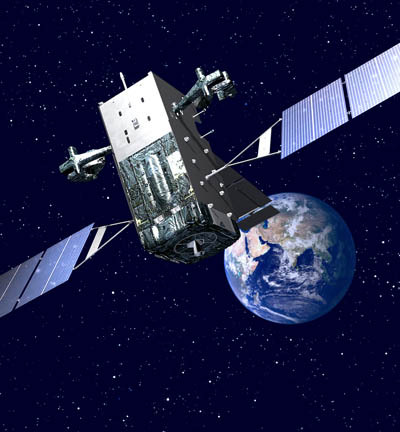 Starting in 1970, the Pentagon deployed a long line of spinning satellites for the Defense Support Program, or DSP. The infrared telescopes continuously scanned the globe looking for the super-heated exhaust plumes emitted by missiles, allowing that information to sound the alarm for the nation's leadership and military commanders. By the mid 1990s, the Air Force selected Lockheed Martin to develop the Space Based Infrared System and use new technology to greatly advance the monitoring efforts by making quicker detections of dimmer objects. The new system would fly "hosted" surveillance payloads on secret spy satellites in highly inclined Earth orbits to observe the northern latitudes and dedicated SBIRS spacecraft parked in geosynchronous orbit 22,300 above the equator for mid-latitude coverage. 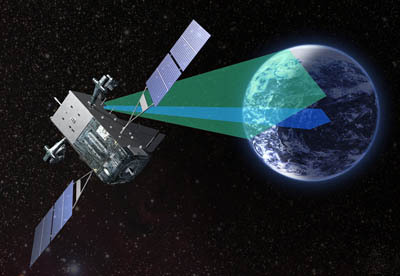 And unlike the previous generation of Defense Support Program missile warning satellites that have only scanning sensors, the SBIRS GEO spacecraft would be equipped with two Short Schmidt telescopes for both scanning and staring instruments to increase the amount of reconnaissance that could be collected. The windshield wiper-type scanner gives a wide view of the planet below and the starer can be tasked to observe a very specific region for emerging threats and fast-moving targets. Building the complex system, however, ran into lengthy delays and cost vastly more than originally envisioned. 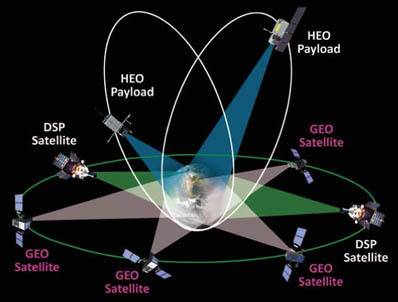 The first highly elliptical orbit hosted payload, known as HEO 1, finally went into space from Vandenberg Air Force Base, Calif., in 2006, a full decade into the development effort. HEO 2 followed from Vandenberg in 2008. 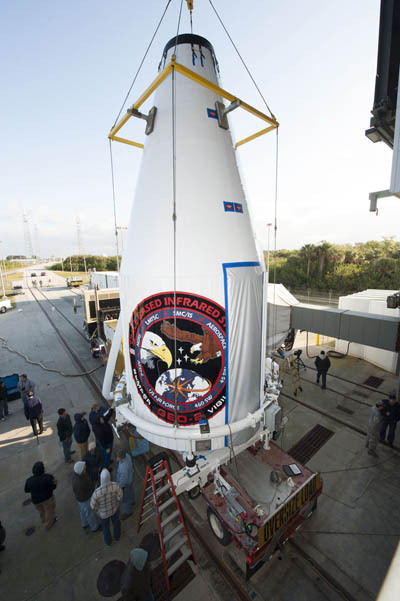 Getting the first GEO off the ground from Cape Canaveral came in May 2011, bringing the modernized enhancements to the surveillance network. GEO 1 has gone through rigorous testing and trial runs to prove its data can be trusted, and project officials say it should be fully accepted into the operational fleet later this year. "Based on GEO 1's on-orbit performance to date, we expect GEO 2 to also provide exceptional improvements to global and theater mission capabilities to our warfighters and the nation," Planeaux said. Lockheed Martin is building four GEO satellites and four HEO payloads, and anticipates beginning production of GEOs 5 and 6 this year, to replenish the orbiting constellation as aging DSP spacecraft fade out. The military won't say exactly how many remain in service. "SBIRS improved sensor technology and ground processing capabilities enable us to respond to growing needs, evolving threats, and will serve us as the foundation of the nation's overhead infrared constellation for many, many years to come," Planeaux said. 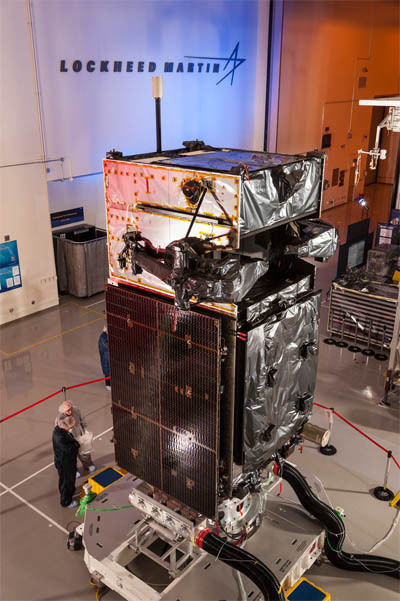 The GEO 2 satellite was mounted atop the Atlas rocket on March 7, allowing the integrated systems test between the duo to be performed successfully. This past week was spent installing ordnance, closing out the rocket's payload shroud and buttoning up the vehicle's other compartments. Mission managers conducted their launch readiness review at the Cape on Friday morning and granted approval for Monday's 10 a.m. EDT rollout of the Atlas 5 rocket from its assembly building to the pad at Complex 41. Tuesday's countdown will start ticking just after 10 a.m. EDT, followed by the loading of liquid oxygen and liquid hydrogen into the rocket a little after 3 p.m. EDT. The day's launch opportunity opens at 5:21 p.m. EDT (2121 GMT) and extends 40 minutes to 6:01 p.m. The window moves four minutes earlier if the liftoff is bumped back to Wednesday for some reason. Weather forecasters predict a 70 percent chance of acceptable conditions during Tuesday's window. It will mark the 37th launch of an Atlas 5 booster in the past decade, the 17th in the 401 configuration with a four-meter nose cone and no strap-on solid motors and the fourth Atlas flight in four months. It also represents United Launch Alliance's 69th mission in six years and the 29th using an Atlas 5. The previous SBIRS GEO 1 was entrusted to fly on Atlas and GEO 2 is the rocket's 12th launch for the Defense Department. Including NRO satellite deployments, this is the vehicle's 19th in service to U.S. national security payloads. The launch of GEO 2 will "take another big step in delivering the next generation of Air Force infrared surveillance capability," Planeaux said. "While our current constellation of Defense Support Program satellites has served the nation and our allies well for over 40 years, SBIRS is bringing unprecedented new capabilities into service to support our mission areas, which are missile warning, missile defense, technical intelligence and battlespace awareness." Weighing about 10,000 pounds at launch, the satellite will be injected by the Atlas 5 into a standard geosynchronous transfer orbit with a high point of 22,237 statute miles, low point of 115 miles and inclination of 22 degrees to the equator. Separation of the spacecraft from the rocket occurs about 43 minutes after liftoff. From there, ground controllers will spend about 9 days performing 6 firings of the craft's main engine to circularize the orbit before deploying the appendages and commencing the testing campaign. "We are obviously very excited for the launch, we're also challenging our team and we're confident we can do this, to achieve the (satellite's) checkout and certification in a little over 6 months," Planeaux said. Built around Lockheed Martin's commercial A2100 satellite platform, with a 12-year design life, the craft is a clone of the GEO 1, having been built at the same time using the same parts. The birds are equipped with RH-32 radiation-hardened single board computers with reloadable flight software. After deploying its pair of power-producing solar arrays for 2,800 watts, GEO 2 will have a wing span of 49 feet. The craft also extends a light shade for the payload and unfolds gimbaled communications antennas for secure, spot beam transmissions. Its scanner and starer instruments, amounting to 1,000 pounds of hardware, have highly agile pointing mirrors and dual infrared sensors that feature short wave, mid wave and see-to-ground spectral band assemblies. "At a time when this capability is more vital than ever, the addition of GEO 2 will further enhance our nation's capabilities for early warning detection of ballistic missile launches around the globe, support our nation's ballistic missile defense system, greatly expand our technical intelligence-gathering capability and provide enhanced situational awareness for warfighters on the battlefield," said Dave Sheridan, Lockheed Martin's SBIRS program director in Sunnyvale, Calif. Integration of the sensors and satellite for GEO 3 will be finished next year for launch in 2015, with GEO 4 following along about a year later in the sequence. HEO 3 is nearing completion in preparation for handover this year to the host NRO satellite. HEO 4's construction is progressing approximately in parallel to GEO 4, according to Planeaux.